CHARLESTON, W.Va. (Jan. 16, 2019) – West Virginia American Water hosted its fourth annual construction season kick-off meeting this week to review the company’s planned 2019 water system improvement projects funded through the company’s Distribution System Improvement Charge (DSIC). 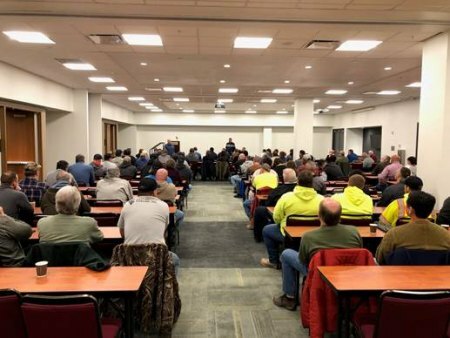 The meeting brought together more than 150 representatives from West Virginia American Water, pipeline, excavating and paving contractors, and officials from the West Virginia Division of Highways and City of Charleston. In 2018, West Virginia American Water spent $23.2 million to replace 146,000 feet (more than 27 miles) of aging water mains through DSIC and another $27.4 million to replace aging fire hydrants, water service lines and water meters. The company also invested $12.5 million to upgrade water treatment processes, equipment, security and technology to comply with the latest drinking water standards and enhance system reliability and resilience. Monday’s meeting kicked off the company’s 2019 infrastructure projects, which include $18.2 million of DSIC project upgrades to water lines, valves, hydrants and water storage tanks. Some of the most significant projects scheduled for 2019 include the completion of water line upgrades along Big Tyler Road in Cross Lanes, an interconnection on Strawberry Road in St. Albans, an upgraded booster station along Woodrum Lane in Dunbar and the completion of improvements along Greenbrier Drive in Hinton up to Summers County ARH Hospital. The company also plans to install approximately 5,000 feet of 16-inch water main to replace two smaller lines along Farmdale Road in Barboursville, boosting the water supply to Huntington and Barboursville. West Virginia American Water customers can see how the company puts their water bills to work on the company’sInfrastructure Upgrade Map. This web-based, user-friendly map provides public transparency to how the company is investing in water main replacement projects throughout its service area. Visit www.westvirginiaamwater.com > Water Quality > Infrastructure Upgrade Map. Once the company’s construction season begins in spring 2019, customers will have the ability to view and learn about infrastructure projects in their area in real-time.